Facing elimination, the Boston Bruins once again drubbed the Vancouver Canucks in Boston. The 5-2 victory on Monday night means that after six games, the series is now deadlocked 3-3. Neither team has lost at home. The Bruins have outscored Vancouver by a total of 17-3 in Boston, but have been outscored 5-2 in Vancouver. The deciding Game 7 will take place Wednesday night, June 15th, in Vancouver. 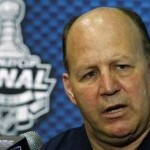 THE MODERATOR: Questions for Coach Julien. ourselves another opportunity and it’s up to us to take advantage of it. guy who seems to have a big impact? Cup finals, you certainly can’t complain as a coach. surprise tonight, four goals so early so quickly like that? that’s what it’s going to take to win. guys responded with shots on goal. What does that say about your club? COACH JULIEN: We’re just focused on doing our job here. important thing right now is not what’s being said but what’s being done. Cup usually have unbelievable goaltending. We feel like we’ve got that. THE MODERATOR: Questions for Coach Vigneault. happened in the first period? of our fans. One game showdown to win the Cup. That’s it. you can see that that happened? turned the page on that and we’re going back home. We’ve got this great opportunity in front of our fans behind us. We’re going to make the best of it. Q. Mason, how is he? Have you gotten an update? COACH VIGNEAULT: No, I haven’t. Q. What was the impact of losing him so early in the game? they’ve won at home, we’ve won at home, and we’re goin’ back home. Q. What do you say to your goalie after you make the change? in next game. He’s going to be real good. preparation for the showdown in Game 7? COACH VIGNEAULT: Sorry, I didn’t get that. COACH VIGNEAULT: We’ve turned the page, gettin’ ready for next game. game. Why the decision to pull Luongo that early? Q. Did he seem rattled? COACH VIGNEAULT: I just felt it was the thing to do. That’s all. excited and our players are going to be excited and we’re goin’ back home. This entry was posted in Advertisements, NHL and tagged bruins, cup final, hockey, Inside Sports, luongo, NHL, sedin, stanley cup, suspension, tim thomas. Bookmark the permalink.